J. H. Stape and John G. Peters (eds), Conrad’s “The Duel”: Sources/Text, Conrad Studies 8. Leiden: Brill/Rodopi, 2015. 49 euros; $63. Conrad’s claim, in his “Author’s Note” (1920) to A Set of Six (1908), that he “had to invent the character of the two officers” of “The Duel” has long been qualified by evidence that real-life models existed and that the story of their duelling had circulated long before Conrad re-invented it. From the 1930s to the end of the 1980s, successively, John DeLancey Ferguson, Donald Cross and Hans van Marle discovered no fewer than eight accounts of the series of duels in which Generals François-Louis Fournier-Sarlovèze and Pierre-Antoine Dupont were locked up for nineteen years, between 1794 and 1813. As this volume brilliantly shows, however, this was not to be the end of the story. Untiring in their search for sources, J. H. Stape and John G. Peters have unearthed twelve further versions, in French and English, originally published between 1853 and 1908. The circulation of the story over such a long period in newspapers, magazines or studies of duelling testifies to the exceptional and emblematic nature of a case which, as late as 2004, still featured in a monograph devoted to this “French passion” (Jean-Noël Jeanneney, Le Duel: Une Passion française, 1789-1914, Seuil, 2004). The volume, divided into four parts, offers a wealth of raw material. All previously known and newly discovered versions are presented in a concise introductory survey which suggests that, if “the version that came into Conrad’s hands cannot be identified,” “[Alfred] d’Almbert whose phrasing is at times echoed in his text, seems to be the most likely” (4). Concluding this introduction, an appendix provides biographical information on their authors. In the second part of the volume, eight of the newly discovered ur-versions are reprinted (those which are not are mere reprints or translations of earlier versions), along with seven out of the eight which had been previously revealed (only a German translation published in Berlin by A. de Nève in 1895 is left out). The volume thus offers a comprehensive and fascinating genealogy of all the known versions of the story. The accounts are republished in their original states, which at times, in particular in French accounts, makes for funny little surprises: “coup” (strike) for “cou” (neck) / “châle”(shawl) for “chalet” (both p. 15); or a few faulty agreements on verbal forms or plurals. These minor flaws do not in any way impair the reading of these accounts which otherwise vary in length and kind: some are fairly short summaries of the affair, others, in particular the earliest version by d’Almbert, read like short-stories, with dialogues passing from one story to the next. Some elements get lost in the rehashing, or, as in a game of Chinese whispers, are curiously altered: thus the duration of the case varies from fourteen to eighteen years, instead of the customary nineteen years; one account even reduces it a mere five years, and, probably to pander to the tastes of the readership of the popular magazine it was published in, gives the narrative a marked sentimental twist. There are fewer French versions than versions in English, and it is interesting to see that after Emile Colombey’s 1861 account, and with the exception of a 1903 retelling in a “History of Sarlat” (Sarlat being Fournier’s native town from which he derived the surname of Sarlovèze that in 1819 King Louis XVIII gave him authorization to use), the story circulated mainly in English. The third part provides an additional 1907 source shedding light on “the ten-line paragraph in a small provincial paper published in the South of France” in which Conrad supposedly first learned of “two officers in Napoleon’s Grand Army having fought a series of duels in the midst of great wars and on some futile pretext.” The sense of mystery over the identity of one of the principals in a duel fought on 3 January 1907 in Viroflay by two lieutenants in the French army, their pact of silence over the origin of the quarrel were the main features which, reported on with various degrees of sensationalism by the Parisian and local press, most certainly caught Conrad’s imagination. The final part reproduces a preprint of Conrad’s story which is a combination typescript/manuscript, enabling scholars engaged in genetic criticism to compare the initial draft with the final form. The volume thus offers multiple points of entry and will also interest textual scholars wishing to study how Conrad drew upon, reworked, and transposed the story’s sources; students or teachers of creative writing will also find ample examples of how source materials alter during the creative process. The volume thus adds invaluable raw material to the ongoing discussion of Conrad’s appropriations and transpositions. Most of the accounts published here were not written with literature in mind, and one is tempted to read them not exclusively for what Conrad did borrow, but for what they do not offer that Conrad’s story does. The conclusion, unsurprisingly, is that it required a creative imagination and a literary talent to transform the incidental and anecdotal into an exploration of the psychology of a historical period. 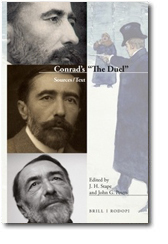 As Conrad put it in the “Author’s Note”, his aim was to capture “the Spirit of the Epoch – never purely militarist in the long clash of arms, youthful, almost childish in its exaltation of sentiment – naively heroic in its faith.” Comparing Conrad’s “The Duel” with the ur-versions of the story reveals the extent of Conrad’s transformation of his source(s) into a thematically tighter and politically sharper narrative. Conrad’s fascination with the Napoleonic era and detestation of the person of Napoleon himself is well known, and under his pen the existing story of this protracted duel opposing two of Napoleon’s Hussars becomes an extended illustration of the notion, already present in some of the ur-versions, that the Napoleonic wars amounted to “a duel against the whole of Europe”. Conrad typically adds a description of the pathetic retreat from Moscow, while none is to be found in any of the potential sources; his insistence on D’Hubert’s politically risky move to salvage what can still be salvaged of Feraud’s status and livelihood in a restored Monarchy, leading to the final encounter, which he transferred from Neuilly to Provence in the south of France, transforms the moment into the confrontation of two secret sharers. The mirror used by D’Hubert may be felt to be a rather heavy-handed device however, both inverting and confirming their characterisation throughout the narrative as inseparable opposites: the fair-haired Northerner embodying “Pride” and the dark-haired Southerner embodying “Vanity” (150–51). Eventually, Conrad’s reshaping of the available material enhances their tragi-comic incarnation of the Napoleonic period. The limited scope granted to journalistic accounts led most authors of the ur-versions to dispense with unnecessary details and minor characters. Thus the scene between Feraud’s maid and D’Hubert, which in Conrad’s story is told with great attention to visual details – Feraud’s hussars breeches, his boots –, the deaf gardener used as a witness in the first duel, or Feraud’s seconds at the final encounter, find no equivalents in the ur-versions. Conversely Conrad dropped the rather implausible duel at the end of which Dupont keeps Fournier “pinned to the wall, as a naturalist would a butterfly” (84), reducing the swashbuckling element to a bare minimum. In Conrad: Intertexts and Appropriations – Essays in Memory of Yves Hervouet (Rodopi, 1997), J. H. Stape convincingly showed that Conrad shared with Balzac “a fascination with the major events, figures, and psychology of the French Revolution and the Napoleonic period and its aftermath” (106) and that Balzac’s influence was “more a case of shared thematic concern than of verbal borrowings or stylistic echoes” (105). He also suggested that Balzac’s Philippe Bridau in La Rabouilleuse (1842) (The Black Sheep) may have been “a direct literary model for Feraud” (p. 113). Both staunch supporters of Napoleon, both equally incapable of adjusting to the new age after the collapse of the Empire, Bridau and Feraud are undoubtedly “cut from the same sizable block of material” (113). This is not in any way in contradiction with Conrad drawing from existing material for a plot, characters and certain turns of phrase. Sources and influences can be multiple and varied, and as this volume amply shows, drawing from sources, and even directly borrowing from them, does not necessarily thwart the creative process.